The Philips P89LPC93x microcontroller (IC2) provided with the MCB900 board is a high-performance, low-pin-count LPC900 device with flexible peripherals. It may be removed from the socket for external programming using a device programmer (like the EPM900 Emulator/Programmer). 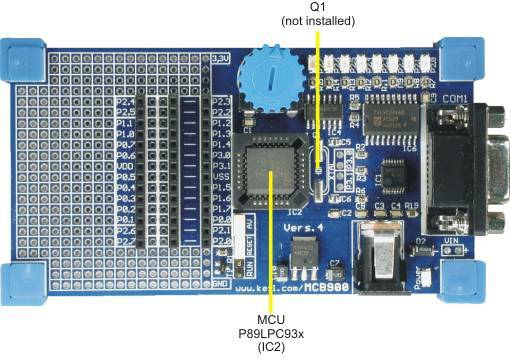 The MCB900 board does not have a crystal, however, a user-provided crystal may be installed at Q1.